The French Open will be starting in a few days, the culmination of a jam packed clay court season on the ATP and WTA tour. While you’re watching your favourite players, try to see what is different in their style of play and tactics. If you’ve been brought up on hard courts like me, playing on a clay court is hard at first, but you will grow to love it. I still can’t slide properly though. The exact opposite is true of Djokovic, if you watch him, he slides on every surface, even hard courts. It works for him, but unless you have elastic legs like him, I wouldn’t recommend it on hard courts. Classic clay court players are of course the Spanish (like the King of Clay Rafael Nadal) and French. 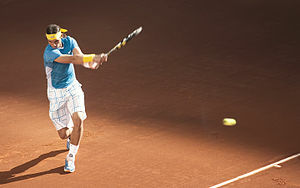 In fact, most of Northern and Southern Europe, apart from the UK, play primarily on clay. Here in Cyprus, there are not a lot of clay courts (they require a lot of water and maintenance) and those that there are are not in particularly good condition, apart from those at Aphrodite Hills. If you do have a chance though, it’s worth trying. So what’s different about clay? What should you be watching for in what will probably be some very exciting matches at Roland Garros? This entry was posted in Cyprus Tennis Coaching, News, Paphos Tennis Coach, Tennis Tips and tagged Aphrodite Hills, Baghdatis, Children Tennis Coaching, Chloraka Tennis Coach, Coral Bay Tennis Coach, Coral Bay Tennis Lessons, Cyprus, Cyprus Tennis, Cyprus Tennis Coach, Cyprus Tennis Federation, Kissonerga Tennis Coach, Latchi Tennis Coach, Learning Tennis, Pafos Tennis Coach, Pafos Tennis Lessons, Paphos Tennis Coach, Paphos Tennis Lessons, Peyia Tennis Coach, Peyia Tennis Lessons, Play Tennis in Cyprus, Polis Tennis Coach, Sports Psychologist Cyprus, Sports Psychology Cyprus, Summer School, Summer Tennis School, T ennis Coaching, Tennis, Tennis Academies in Cyprus, Tennis Academy, Tennis Centre, Tennis Club, Tennis Clubs in Cyprus, Tennis Clubs in Limassol, Tennis Clubs in Paphos, Tennis Coach Pafos, Tennis Coach Paphos, Tennis Coaching, Tennis Coaching Pafos, Tennis Courses, Tennis Equipment, Tennis Holiday, Tennis in Cyprus, Tennis in Limassol, Tennis in Pafos, Tennis in Paphos, Tennis Lessons Coral Bay, Tennis Lessons Cyprus, Tennis Lessons in Cyprus, Tennis Lessons Pafos, Tennis Lessons Paphos, Tennis Lessons Peyia, Tennis Peyia, Tennis Pissouri, Tennis School, Tennis Tournaments in Cyprus, Womens Tennis by Paphos Tennis Coach. Bookmark the permalink.